Have you ever dropped your mobile phone, sat on it or spilt coffee all over it? Thought so. But handsets are getting tougher these days thanks to a series of tests they go through before hitting the shops. Nokia opened its test centre doors to TV cameras for the first time to show how devices are put through their paces. Engineers carry out more than 200 physical tests - below is a selection of the weird and wonderful ones. Mobile phones have each navigation key pressed half a million times to check wear and tear. When Nokia introduced games onto some handsets, it found certain buttons were being pressed more often and harder than others. So different pressures are now applied and the select button and number keys which are used more often get pounded a million times. Another test aims to check how handsets perform when put in and pulled out of trouser pockets. A trouser leg is used to rub the devices up and down 750,000 times over a period lasting several days. This is a much about testing for dust build up as it is about marking and discolouration. Another repetitive test is manually plugging in and removing the charger for each handset at least 6,000 times. A group of people are employed do this because, unlike machines, humans do it differently every time. Engineers also mimic the scrapes and scratches you might get from keys or purses in a handbag. The handset is put in a revolving container with sharp items to check how it performs. Each device is put in a lightbox and exposed to four different types of lighting, including UV, to check for any discolouring. It is also sent into the ovens and freezers for six days - each phone must operate between -20 and 55C. Then it is sauna time - being exposed to 95% humidity means the handset is dripping wet but it needs to work within two hours of coming out. The best advice if you do get your mobile wet is to turn it off, take the battery out, and dry out the casing on a radiator. Most mobiles are not designed to be waterproof but equally they should work fine when you need to take a phonecall in the rain. 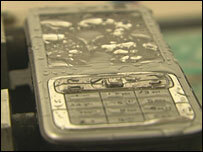 Engineers check that a device remains fully functional in such a scenario by dripping water on it for three minutes. "I dropped my phone in the front yard and my dad ran it over with a lawnmower about one min later," wrote @JerBear1984. "Last week my brand new HTCs620 vibrated off a shelf and fell in a sink full of water when it rang," wrote @uroborosmessiah. "I left mine on top of the car once, drove off, then realised what I'd done, reversed back straight," wrote @meerkatmatt. Nokia has come up with a more scientific process to test mobile phones to destruction, except they're expected to survive. The handset is dropped twice on each face, every corner and each edge from 1.5m onto reinforced concrete. The back and battery may flip off, but once re-assembled the phone must work perfectly. 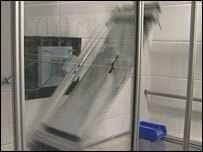 Each of the sample phones must survive 120 rotations in a metre long tumble cage, and 180 in a smaller one. The tumble is roughly the equivalent of knocking the device off a desk and it gives an idea of general durability. 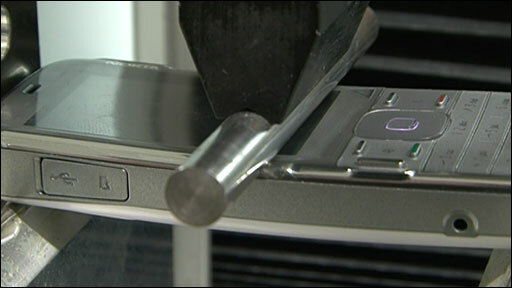 There is also a twist test - a force of 40 Newton metres turns the handset until the battery cover is about to flip off. Imagine a 15 stone (95kg) man sitting down with a phone in his back pocket. To survive this, the handset must pass a flexibility test which sees 130 Newton force being applied to it with an iron bar. 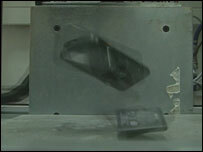 When mobile phones fail tests, they are taken to the Forensics Lab where researchers look into the reasons. The different layers of each component are looked at, with X-rays being used to spot hairline cracks and a laser light checking the handset's exterior condition.